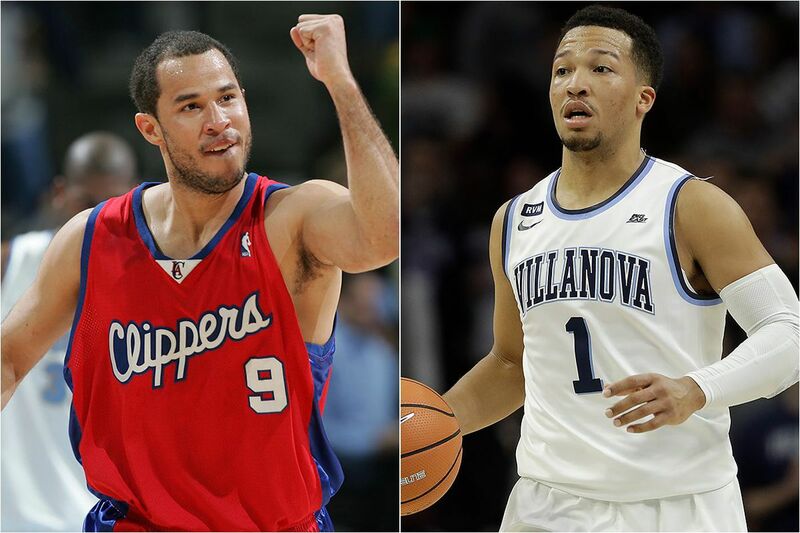 Rick Brunson during his days with the NBA’s Los Angeles Clippers (left) and Jalen Brunson in action for the Villanova Wildcats (right). Kevin Ollie played with Rick Brunson in the Continental Basketball Association. So after Ollie, Connecticut's head basketball coach, watched Jalen Brunson lead No. 1 Villanova to a convincing win over his Huskies, he was asked to compare father and son. "His dad was really good but I think Jalen's a little bit better than his dad," Ollie, a former 76er who played in the NBA for 13 seasons, said Saturday after the Wildcats' 81-61 victory in Hartford, Conn.
"Rick was a great player, played with him in the CBA. But Jalen is a really, really heady point guard. His dad was the same way. But he's very sneaky and deceptive with his speed, so he can shoot it deep, he can get in the lane, come to a jump stop, make passes. They've got shooters all around him." Brunson impressed against UConn in Villanova's final regular-season nonconference game. After missing seven of his first eight shots, the 6-foot-2 ½ junior knocked down his last eight attempts, four of them three-pointers, for 20 of his game-high 23 points. Even more impressive: Those last 20 points came in a span of 8 minutes, 47 seconds. Villanova coach Jay Wright said that he and his team saw Brunson get into those kinds of zones last season, and that "now it's kind of gotten to be expected." "It's more shocking if he doesn't do it," he said. "Even when he wasn't making shots, you never worry about him because he's the most mentally tough guy I've ever been around. He's going to find a way." Brunson, the preseason Big East player of the year, is maintaining some incredible statistics. Entering Tuesday night's game against Providence, he was second in the nation among guards in field goal percentage at 57.7, and his 3.30 assist-to-turnover ratio ranked 12th. He was second in the conference in three-point percentage (48.5) and third in assists (5.2 per game). Wherever he goes, Wright is asked about Brunson's maturity and poise as the floor leader of the nation's No. 1 team. "I say this all the time, and jokingly, but it's the truth: He's the most mature person in the program, more than the coaches," he said. "I get on the bus, dropping stuff. He gets on the bus, everything's perfect. It starts with him. He's very mature and he allows us to coach him." All that adds up to "one of the best point guards in the country," according to Ollie. "He's poised, can shoot it, can drive it, can post it up, can pass it," he said. "He's got the total game. He's always under control. He knows exactly what Jay Wright wants at all times so he's a great point guard."